Marina Good ’19 explores the innovative potential of the science industry at a local biotech company. Find out how the Harrington Center can help you put your education to work. 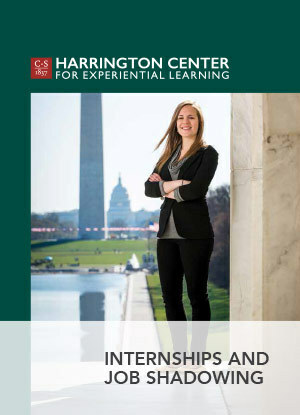 The Harrington Center for Experiential Learning, an integrated professional development collaborative, provides you with academic advising, career-development opportunities and internships. These services are designed to encourage intentional decision-making, develop professional skills, promote life-long learning, and teach global citizenship through experiential learning, self-understanding and personal reflection. Over a five year period, 97 percent of our graduates are employed or attending graduate school within six months of Commencement. One reason for our graduates' success is the internship program and the requirement that all students complete at least one internship or field experience in order to graduate. In a five year average, 37 percent of Colby-Sawyer graduates are offered a position by their internship sites. Internships are field experiences collaboratively supervised by faculty, staff and work site professionals. Internships allow you to enhance your academic learning with experience related to your career interests in local, national and international settings. All students are required to complete at least one internship, but opportunities exist for two or more internships for those who want to gain significant hands-on experience. See available opportunities at CollegeCentral.com. If you are interested in contributing to the professional development of our students, please consider taking on a student intern. Your job and internship opportunities can be shared on CollegeCentral.com. If you have any questions or would like us to post your opportunities for you, please contact Jennifer Tockman at Jennifer.tockman@colby-sawyer.edu or (603) 526-3765.